Wov! Wov! 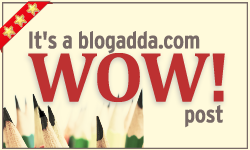 Thank you so much blogadda for the badge. It feels so good to be selected as a winner once again. Thanks to Blog Adda for giving me an opportunity to write from different perspectives which would not have occurred to us otherwise. Every week I eagerly wait for the prompt. Thanks again.